It’s the classic Inca Trail experience with an extra day in the Cuzco area to acclimate and participate in your choice of an outdoor activity: biking, whitewater rafting or horseback riding. 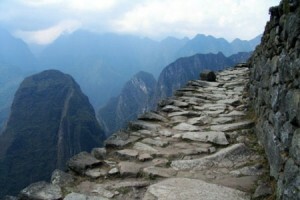 Why hike the Inca Trail with us? Our guides are the best in the business, with an excellent knowledge of the trail, the Incas, the flora and fauna, and excellent English to go along with it. The cooks we use are also top-notch, serving up delicious food the entire way. All you’ve got to do is hike the trail and enjoy the incredible sights and vistas unfolding before you. Day 3: Choose your own multisport activity. Day 4-7: Inca Trail hike / Machu Picchu. Day 8: Morning flight to Lima / Departure day. You’ve got one more day to acclimate before you hike the Inca Trail, and you have your choice of how you’d like to spend it! 1. Mountain biking and off-road excitment, culture and spectacular scenery. On this route, situated less than an hour away from Cuzco, we will visit the impressive terraces of Moray (Inca agricultural experimentation area) and the Maras Salt Pans. Today we’ll not only cycle up and downhill through defined paths, but we will feel the excitement of following very fast and fun downhill single tracks towards the Sacred Valley. 2. Whitewater rafting the Vilcanote River: We will be navigating class III and IV rapids through the Yaucat Canyon on the Vilcanote River, which was the Inca’s most sacred. Lunch on the banks of the river, then an early afternoon return by car to Cuzco. 3. Horseback ride to the ruins above Cuzco: A more relaxed option as we follow old trails to Tambo Machay, an Inca water shrine, and Puka Pukara, an Inca fort, in the beautiful countryside above Cuzco. This is a half day excursion, leaving you in the main square with time to shop or stroll in the afternoon. 4. If you’d just like a free day, then what you’re looking for is our Classic Inca Trail tour. Early this morning we start walking the Inca Trail towards Machu Picchu! A morning drive brings us to Piscacucho kilometer 82, start of the world-famous Inca Trail trek. Our first day is an easy one to get acclimated, as we gently climb through Andean valleys to the village of Huallabamba, making our first camp just above it. Along the entire trek we are well taken care of by our team of porters and cooks, freeing us up to fully enjoy the Inca sites and vistas unfolding before us. Parakeets, bromeliads and the major Inca site of Llactapata are some of today’s highlights. Tonight we camp at Wayllabamba. Morning flight to Lima. International flights may be scheduled anytime after 2pm today. Active Inca Trail is a eight day tour which includes a four-day, moderate trek as well as walking around ruins and during city tours. No trekking experience is required, but one should be in average physical shape and not suffer from any heart or respiratory conditions. As always, a certain patience is required for the inconsistencies and occasional delays of developing-world travel. Hiking the Inca Trail is an amazing experience. Add extra activities such as river rafting, horseback riding, mountain biking, hiking, climbing, zip lining, surfing, and free days to your custom itinerary. Ask about these options and we’d be happy to add them to your quote. If you have any special requests or interests like birding, cooking or crafting that you would like to explore please let us know! This tour includes 3 star hotels. We would be happy to give you an upgrade to four or five star. Please ask then work it into your custom itinerary. During our trek, porters will accompany us to carry most of our things, including all the camping gear. Each passenger is allowed 15 pounds / 7 kilos of personal items which will be carried by the porters. Such items would include warm clothing for camping, toiletries, etc. During the day you’ll be using a your daypack and will just need to carry water, snacks, rain gear, and a layer for changing weather conditions. Of course most people also carry a camera.